Opening night. Music policy is 'play what you love', so expect a variety of styles and sounds from a DJ lineup we are honoured and humbled to present. Look forward to welcoming you and Mr M to our event. Lots of interest in this night about time a night like this took off in this North lancashire area. Hope it grows from strength to strength. We've been back to the venue today. In terms of the floor, no talc is needed. It's fine as it is. Seriously, we can't wait and thank you both so much . Spoke to him last night and is really looking forward to it. As have all the djs sorry, didn't get chance to get your mobile number as we did ambush u at burscough but as always you will knock it out of the park. Looks like a few familiar face will be attendance which is great As it says in description we're proud and honored for your services and all the other djs. Hope it’s a cracking first night! Really looking forward to playing a few records and catching up with folk. It's gonna be a great to see you both and 1st beers on me. Lots of great feed back and hoping for a good night. We know for one thing the music gonna be top draw. Whoa! What a great line up. Only a last minute 'Booty' call would keep me away! Ta Mr W. Be good to catch up for real again soon. 1st beers on me. Does that count for me n Craig I'm definitely playing out...................... twice in one night. Like the old days. Wrong Crowd Soul night then onto Swinton. I've messaged Jayne n Craig to see if they playing out. Be good as always to see you mate. Looking forward to saturday,great line up !!! Over from NY visiting my mum in Heysham. Might pop in if that’s ok. 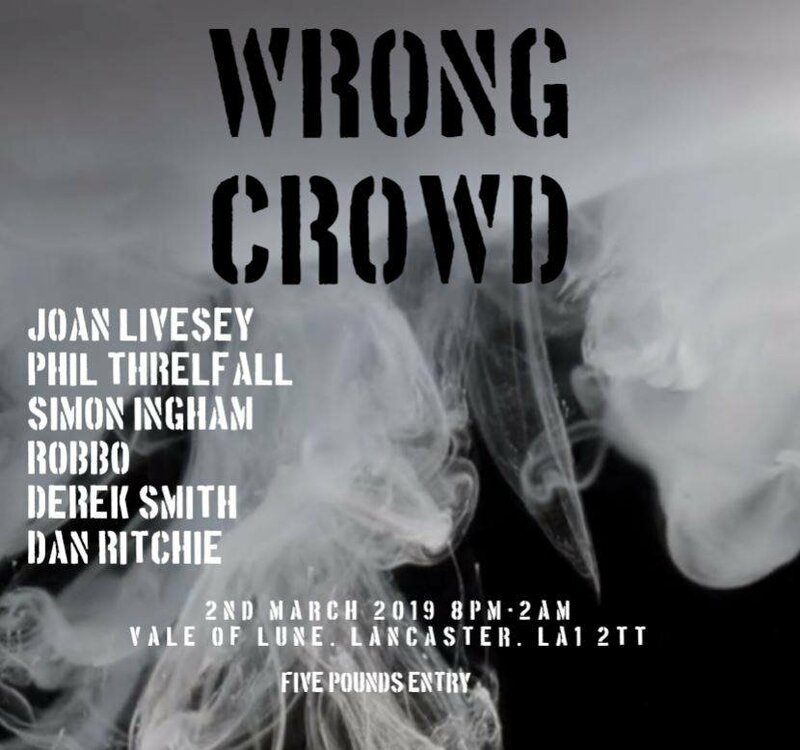 Looking forward to a great night with the Wrong Crowd tonight! Cracking lineup, see you later. We want to say thank you all so much to each and every person that came and made the night what it was. A huge thanks to Joan, Phil, Robbo and Simon for playing from the heart, creating a seamless flow of musical delights. A huge thanks to the wonderful (wrong) crowd of people that traveled from far and near and created an electric atmosphere. How will it be I wonder, if we ever meet again? The pleasure was all ours. Thanks for all the time and effort it takes to put on something like that. I want to thank everybody who supported us last night. I have spent the day reading the feedback from everyone who came and, my god, what a night. A huge thank you to our DJs for their inspired sets. Truly brilliant.